Traveling around Europe is a great way to find yourself, especially considering your lack of success accomplishing it with that personalized Waldo book, Where's Lance? Successfully finding choice gear for you, post a European jaunt, the owners of International Playground. IP's a cozy, steel-accented, cargo-case-stacked boutique started in NY & just now open in LA in the former Mohawk General Store spot, started by a couple who assembled their carefully-curated team of designers while opening pop-up shops in Paris, London, and Copenhagen, a safe choice as opening in Kodiak Wintergreen made people throw up. 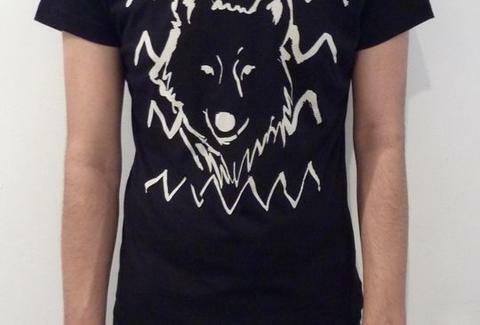 Most of their current slew of designers are either from New York or Norway (obviously), with wears that include shiny grey button-downs from Carlos Campos, a sweatshirt w/ a diagonal, foil graphic of Russian Matryoshka dolls, and tees from artist Mary Meyer featuring an outline drawing of a wolf's face, with proceeds going to save the Mexican Grey Wolf, apparently the most endangered species in America, though the real question is whether he got here legally. For the lower half, they've got low-pocketed jeans from Ravishing Mad Marv, and below-the-knee shorts from Daniel Palillo, as well as accessories like bags, belts, and ties from Ernest Alexander, who felt he needed a real challenge after going to jail, camp, school, and the army. They've got an in-store soundtrack curated by the NY publicity firm Girlie Action (featuring acts like Sia and Andrew WK), and in the next few months, they're expanding their in-store selection by reaching out to LA designers, who're especially hard to find, mostly because their striped clothing can be so easily confused with barber poles.